I still remember those early mornings. I’d wake up, walk over to get a bowl of cereal from my mom, and sit myself down in front of our big wooden box of a television. It was a classic lineup of children’s programs: Sesame Street, Lamb Chop, Thomas the Train Engine, and of course, Mr. Roger’s Neighborhood. For a daughter of a working class father and an immigrant mother, those early days before I started going to school were spent playing and learning at home. Sesame Street taught me how to spell. Lamb Chop taught me the song that never ends and to this day, I still use it to annoy my students sometimes! Hahahaha! 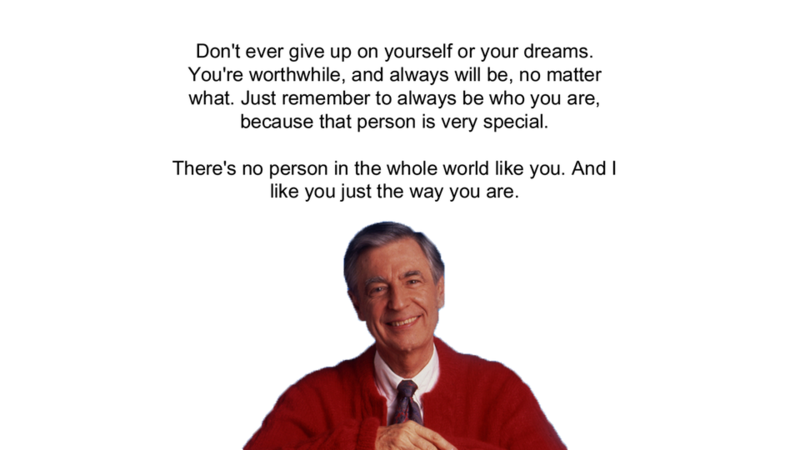 Though I loved these shows dearly, none captured my attention and my heart more than Mr. Roger’s Neighborhood. I was happy to see Mr. Rogers trending this morning because of the sweet Google Doodle that appeared this morning. Though I began watching him when I didn’t know English, I continued watching his show well into my early teens. There’s a reason the documentary on him, “Won’t You Be My Neighbor” was so popular this summer: Everyone was impacted by the kind and gentle lessons of Mr. Rogers. Now that I’ve gotten older, I see how much of an impact the man had on me almost three decades ago. Mr. Rogers started his program on a small budget on a local television station out of concern for what was being shown on TV. His program expanded to stations nationwide when PBS (the Public Service) began airing the show. During the Nixon administration, it was one of the programs considered for a severe budget cut and Mr. Rogers spoke to the Senate subcommittee to express why the funding for PBS was vital to the development of young children across the United States. Both on his show and during this senate hearing, he advocated for others and strived to create more understanding between different groups of people. There were many things those early years that were considered taboo to talk about. Mr. Rogers didn’t shy away from those topics that other people would try to shield kids from, such as dealing with anger, death & grieving, and divorce. In this episode, Mr. Rogers explains divorce to his audience. When my parents divorced when I was 4, even at that age I understood it was because they weren’t happy. Being to understand the pain and suffering my parents were both experiencing at that time led to me having a strong sense of understanding others. As a teen, this often helped to to recognize bullying for what it really was. Rather to blame myself immediately for the way others were treating me, I learned to step back and ask myself if that person was acting out of pain for something that was happening in their own life. Early on, I realized that how someone is acting on the outside is a direct reflection of what’s going on on the inside. This is something many of us can reflect on even today. When Mr. Rogers spoke in front of the Senate subcommittee to save PBS, he stated, “Make it clear that feelings are mentionable and manageable. We will have done a great service for mental health.” As someone who is a huge advocate for mental health and struggles with my own, I cried hearing him express this when watching this video now as a 32 year old. Now more than ever, we as a society need to hear that it’s ok to reach out and talk to someone for support on managing our feelings. Today, our coping mechanism for loneliness is no longer community. We reach to our phones and devices for comfort. In an interview with Charlie Rose, at minute 2:10, Mr. Rogers expresses “I'm very concerned that our society is much more interested in information than wonder... in noise rather than silence.” We are the nation of busy. During a time of need, I reached out to several friends for support. Some responded with being so busy that they wouldn’t be able to meet for a month, others had laundry to do, some didn’t reply at all. It’s in times like these that we must make the time for silence. We must make time for community. We are all going through something and especially for those of us in careers where we are of service to others, if we don’t take care of ourselves, how are we supposed to show up for others? Fortunately for me, I had a group of great friends who did show up for me and it has meant everything this past year. More than anything, Mr. Rogers is known for his dedication to creating more understanding. He knew that children come into this world passionately curious and full of wonder. They ask questions that by adulthood we’re too afraid to ask. He knew that if you took the time to explain things simply and patiently, kids would understand. I’ve found in my own teaching career, it was often my students who understood and accepted me for who I am, faults and all. They were kind, patient, and understanding. We can learn so much from children if we only let ourselves. What people don’t realize is that children all across North America were hearing the same message. It’s important to recognize that for some children, it may have been the only time during their childhood they heard someone say they were worthy of being loved. For some of us, it served as a reminder during difficult childhood moments. For many, as adults it continues to serve as a reminder that we are worthy and that our lives matter, even when society says otherwise or the challenges we face don’t allow us to believe it. Though I’m not a kid anymore, Mr. Rogers has more of an impact now than I think he did then. I’m now an adult and can reflect back on some of those difficult times and recognize that I always had the strength within to overcome anything, I just needed to tap into it. For most of my life, that’s been the case. During others when it’s not, I find myself coming back to those kind words from that gentle soul and think about how we as adults can continue his legacy. There are several simple things we can do. In my own life, taking care of myself comes first now. Getting plenty of sleep, eating in a balanced way, and walking in the warm sun are some of the things I’ve been doing most recently. For me, that’s just the foundation. I’m making more of a conscious effort to add to that by allowing myself to revel in the silence and wonder of my life. Not feeling guilty when I’d rather read a book at home than to go out for a late night out on the town (spending money I don’t have). Being self-compassionate when I see examples of my imperfection. Surrounding myself with the closest of soul friends, rather than looking for acceptance and recognition from those who don’t matter in the end.